Wow, Ken, thats really nice- is this the same chipset you sent me last? I hoped the last update would be the good for a while, but I found when I transferred the X-pipe and all my logging stuff over to the '85 that the WBO2 had been reading nearly 2 points leaner than actual! I had the injectors flowed, they were OK, and I had recalibrated the LC-1 often. I think it may have been the initial warmup calibration of the LC-1 that was off. I chased my tail because of that (unknown to me) richness for a myriad of side effects, but I guess it was good because I learned a lot. The new chips are verified against the dyno wideband (tailpipe shows ~0.5 AFR leaner than at the X-pipe), and feel even more powerful than before. I'll work my way back through the list and update everyone. BTW: In order to save space on the chip label for more info, and because I was optimistic before this dyno run, I registered 'S300s.com' to print on the second line. IE. S3, 300s at the wheel! Those are incredible numbers! So at the crank its about 375hp? That's a little optimistic, I think. 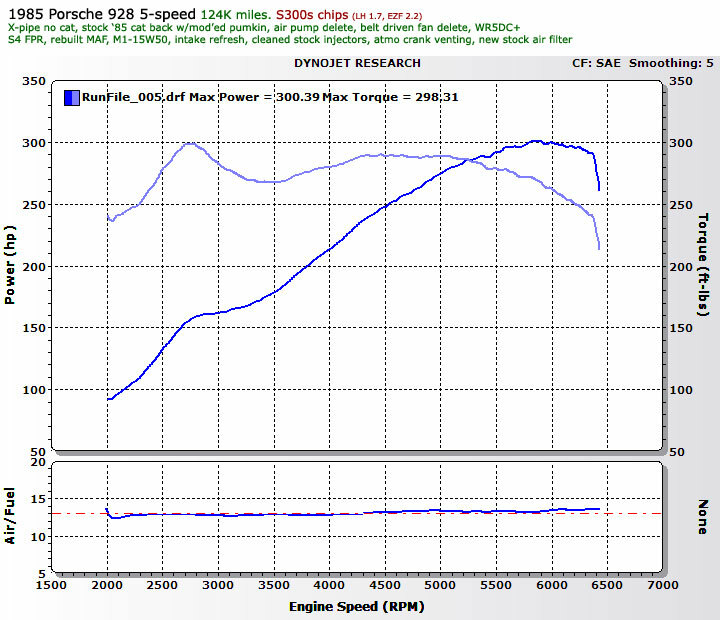 It's a numbers game, but if you use 15% for the manual, 300 SAE RWHP / .85 = 353 CHP. 65 CHP over the stock 288! Not too shabby! And, basically any S3 5-speed should get these kind of numbers with just an intake refresh and X-pipe, which is cool. A little bit more air in the intake should help! BTW: do you still have the '85 cat-back? Even with the pumkin mod, it is definately a restriction. I keep having to tap the cat-back back into the X-pipe after all the WOT runs I've been doing! Sorry, I missed this question last time. Yes, I've still got the '85 cat-back and I had to have it welded to my cats because it kept blowing out. I'm not sure what I can do because I don't want it to be any louder than it is because it's my daily driver. Was hoping to try a set of electric exhaust cutouts (open for dyno or track days, closed for the street) but it doesn't look like the budget will support that this winter. I'll paypal some more cash for shipping when the new S300s chips are available. Let me know. BTW- GREAT dyno run! Congrats. What a huge improvement over stock. Nice work. Good work, Ken! On the "s300", also..
Something is limiting the top end. I started logging the EZF MAP sensor (pin 21, 0-5V, lower=vacuum). At 2000 rpm, manifold pressure is highest (~atmospheric), but steadily decreases (=vacuum) towards redline. I'm not sure if it's the undersized exhaust, and/or a restriction in the TB, housing, airbox, or inlet tubes, and/or the stock cam timing. 80% injector duty at redline at 55psi. 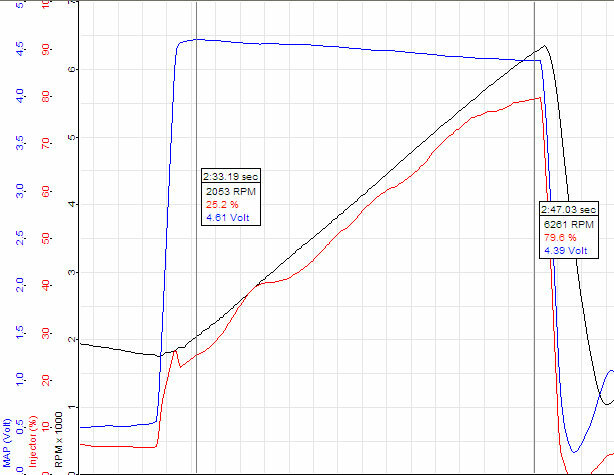 Note how injector duty closely matches the HP graph. Is the drop from 4,61 v to 4,39 v signifcant ? Maybe the computer cuts the fuel supply at high rpm because the MAF readings say not enough air. Bernd has cams with more lift but no x and I a 80 mm tb and the same setup as you.The 2 different dynoruns will be interesting. Since you stated the injectors seemed okay...new filter helps a little...atmo crank venting maybe a little...is the intake refresh really where all the missing power was hiding? 23hp is a TON!!! Ken, a restricted exhaust would cause the MAP slope to go the other way, ie: higher as RPM's increase, as pumping efficiency drops. Your slope suggests intake restriction upstream of where the pressure value is picked off. There's a little 'puffery' there if you look closely. The second dyno sheet is in STandarD correction with smoothing of 2. (STD correction is based on a higher ambient temperature.) If you look at the graph in (SAE with 5 smoothing), the proper comparison is 287/290 versus 300/298. 13 rwhp is still a nice improvement! I did tweak the chips a little too, but not so much at high rpm, so HP was mainly from the intake refresh, etc. The injectors I had flow tested were on my '86.5 (Ford type). I had the stock injectors cleaned on the '85 for the second dyno run. What did you do to the intake to refresh it? What change did you make to the vent sys to go to atmo? I didn't have time but I mean to make a plate to replace the oil fill tower with a 1"+ hose outlet to exit under the coolant bridge (large cave on pax side) for both oil filling and venting. I would like to put a hose blowing cool air (via a bilge blower) into the space where the oil filler tower was, to cool the underside of the intake and MAF. The EZF MAP sensor gets it's vacuum from the 7-way splitter, which goes to a port just above the throttle plate. It would make sense then that it's before that point. Throttle plate<-housing<-MAF<-filter<-airbox lid<-tubes. ...until I get me a turbo or sumpin' up in thar. Ken, thats a bit-o' work there.. I am making a housing that goes where the orig oil-fill-vent housing is for someone else, maybe he will share and it can be made like you want it..